The word organic is perhaps the word of the decade in regards to the evolving world of food. What does it mean? Why is it important? Why is it more expensive than non-organic food? “Organic” is the word used to describe plants that have been grown free of pesticides, herbicides, chemicals and genetic manipulation. As big-box companies have been increasingly greedy, these practices has become less popular with mainstream brands and food corporations because they require more diligent care and money by farmers. These large corporations and brands pay farmers to grow in soil that has been prepped with powerful weed killers, and plants that have been coated with insect/bug resistant toxic agents. All of these things are done in an effort to maximize the size of their harvest. What they neglect to make a priority is what these practices mean for the health of those that consume them. These greed monsters have put health on the back burner and have focused their attention on profit margins. They spending as little as possible to grow and produce these fruits and vegetables and then charging the masses for their contaminated plants. Health Canada’s Launches sugar, salt, fat symbol. But what about the 5 toxins in our Food? The Minister of Health, Ginette Petitpas Taylor, today announced that Health Canada will launch consultations on regulations for a new front-of-package symbol on food. This is part of Health Canada’s eating strategy. The irony is, that these items (salt, sugar and fat) are already on the label for food packaging and include the percentages contained in that food. So what is going on here? What is not labeled, are 5 toxins in our food which are: Hormones, Antibiotics, Slaughterhouse waste fed to farm animals, GMO’s(glyphosate) and pesticides. All but pesticides have been banned in Europe for decades. STAND UP – For Food Safety – This 4-minute doc urges citizens to mobilize, ban contaminants in our food supply and take back the food system. Produced by The Canadian Council on Food Sovereignty and Health. A food advocacy group campaigning and organizing for sustainable agriculture and an organic food system. The Council promotes a ban on toxins currently permitted in our food supply. Thanks to industry self-regulation hormones, antibiotics, slaughterhouse waste, pesticides & GMOs continue to be approved by Health Canada and the Canadian Food Inspection Agency – contrary to the Food and Drugs Act! 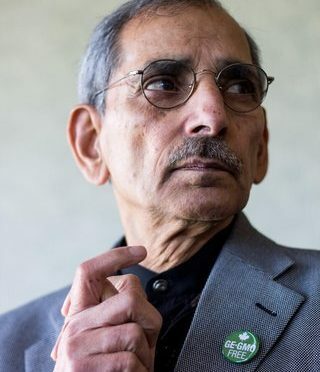 Chopra was a hero of the non-GMO movement, best remembered for leading the resistance to government and industry pressure including agro-chemical giant Monsanto to approve bovine growth hormone in Canada. On January 7, the former Health Canada scientist and whistle-blower who believed “we should take food out of the economic equation” quietly succumbed to cancer in a Kanata hospice, surrounded by family. He was 84. A memorial for family and friends will be held January 20 in Ottawa. A public memorial will be held in February. Online tributes continue to pour in from all over the world in response to the loss of Chopra’s courageous voice from the front lines of food safety activism. A microbiologist and drug safety regulator with the Bureau of Veterinary Drugs for 35 years, Chopra is best remembered for leading the resistance to U.S. government and industry pressure including from agro-chemical giant Monsanto to approve bovine growth hormone (rBGH) and other veterinary drugs of questionable human safety. Monsanto insisted on Health Canada’s approval after the U.S. Food and Drug Administration rubber-stamped the drugs for licensing. But Chopra and fellow scientists Margaret Haydon and Gérard Lambert refused, pointing to gaps in Monsanto’s safety data. 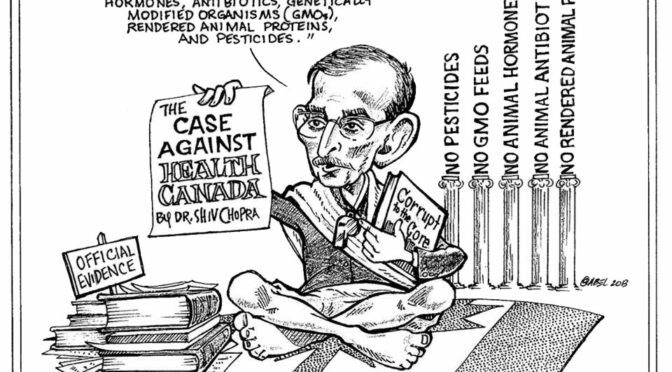 The in-house controversy hit the fan at Senate hearings at the Standing Committee on Agriculture and Forestry in 1998, where Chopra delivered unflinching – many say heroic – testimony that blew the lid off government and industry complicity in Health Canada’s drug approval process. His insistence on “my duty to speak out” made Chopra a darling of the non-GMO movement, but he refused to wear the hero’s mantle. 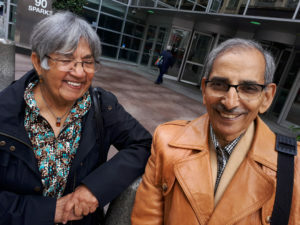 “Canadians owe Shiv Chopra a great deal,” Council of Canadians chair Maude Barlow said in a recent Ottawa Citizen interview. But despite parliamentary assurances to the contrary, Chopra and his colleagues would be subjected to severe reprisals from their Health Canada bosses for going public, and would ultimately get fired for insubordination, receiving their notices in the mail on the same day in 2004. Chopra was a model scientist who came up against systemic racism and government misconduct almost the moment he entered the civil service in 1968, filing two landmark human rights complaints alleging discrimination in the public service in 1992 and 1993, before transforming himself over the years into an anti-corruption warrior inside the health services branch. The Senate hearings produced a list of recommendations around Health Canada’s drug approval process. But none were ever implemented, according to Chopra, who in 2014 founded the Canadian Council on Food Safety and Health to carry on his work of food safety advocacy and education. After years of grievances and appeals, an adjudicator ordered the reinstatement of Lambert and Haydon but not Chopra. But his son Anil says that his father wasn’t really fighting to get his job back. Tributes have been pouring in from all over the world – Friends and supporters: instead of sending flowers Dr. Chopra requested that donations be made to the Canadian Council on Food Safety and Health, a non-profit founded by Dr. Chopra to carry on his advocacy and education work around food safety, and sustainable agriculture. At a genetic level, humans are literally connected to the rest of the natural world through our DNA. But today’s highly processed foods, pesticide based mono-culture farming methods, increasing urbanization, obsession with technology and destruction of the natural environment distance us further and further from the world we co-evolved with. We are out of balance with nature and the reductionist philosophy of modern western medicine, once immensely powerful, seems inadequate to answer today’s challenges. 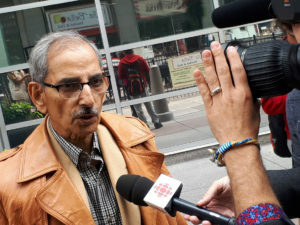 Dr. Shiv Chopra, former regulator for Health Canada speaks out regarding vaccines and toxic food. De-occupy our bodies! Dr. Shiv Chopra has lost his 13-year battle to regain the Health Canada job from which he was fired in 2004. The ruling came from the Federal Court of Appeal on Wednesday. Chopra called it a “travesty of justice.